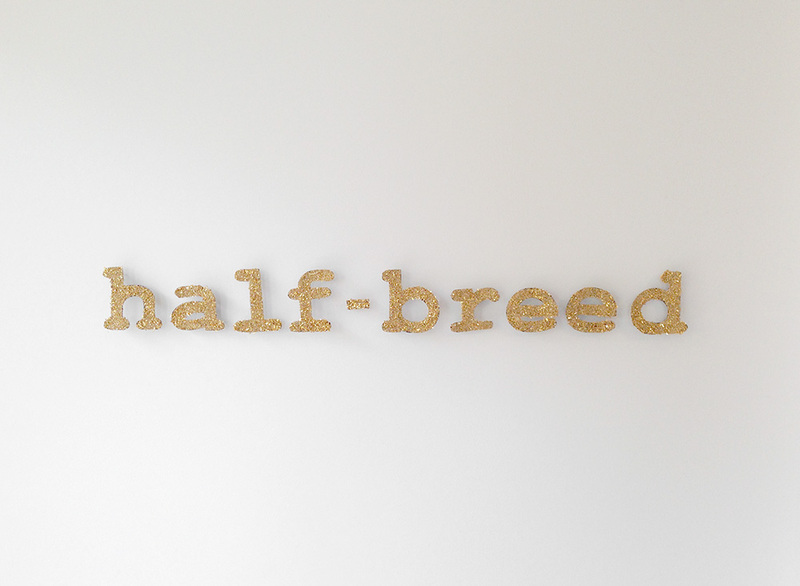 Angela Drakeford is a sculptor and installation artist working out of the American heartland—Omaha, Nebraska. Drawing from personal experience, much of Angela’s published pieces deal with racial identity and the impact of those dynamics on interpersonal interactions. I had the pleasure of speaking with Angela about art-making, her exploration of new themes (“ruined” women) and new media (chain mail), and the often-unrecognized biases we all must come to terms with. Can you tell me a little bit about how you found your path as a sculptor and an installation artist? I took a lot of art classes in high school but I never really thought about having a career as an artist, because it’s one of those things that’s pretty unrealistic, in most people’s eyes. So I went to college as a women’s studies major in the hopes of becoming a social worker. Then after maybe a year of doing that, I was like oh, maybe I’ll start taking some art classes just as electives and got obsessed with art classes again. Decided to take that huge risk of ‘I’ll get a BFA!’ And I decided to do that. I decided to do sculpture because sculpture in my undergrad was pretty much the only field you could be in where you could just do whatever you wanted. Sculpture was the catch-all, you could do video work there, you could do installation. That’s true, that’s kind of sneaky! Yeah, sculpture is now the catch-all. Yea, sculpture. It’s an object! …it is definitely helpful to my art practice, how people view me. I feel kind of empowered by it, actually. I like being one of those making people feel really uncomfortable. I guess that’s one of those buzzwords that gets thrown around a lot, right? ‘The art object’. So I was wondering, are there any peculiarities of being a fine artist in the heartland of the United States? My entire practice is based around what it feels like to be a minority in the middle of the country. I find that a lot of my interactions with people become very interesting because people generally don’t know what race I am, it’s very curious. I find myself being open to conversations I normally wouldn’t—I shouldn’t be hearing these conversations, they’re obviously not meant for me. Being in the middle of this country is a really interesting experience. We don’t really value artists in the heartland. And we definitely don’t value women artists of color in the heartland. But it is definitely helpful to my art practice, how people view me. I feel kind of empowered by it, actually. I like being one of those making people feel really uncomfortable. Yeah, that seems really awesome to be driving an art scene forward. Yeah, let’s have some critical conversations about what’s actually going on here! Art as a societal whole maybe isn’t valued in Nebraska, but is there a particular art scene in Omaha? What are the vibes? I think that Omaha would—I feel like I’m about to trash the city I live in. Omaha does have an art scene that is developing. We have the Bemis Center, which is one of the top ten artist residency programs in the world. We also have the Joslyn Art Museum, and the Union for Contemporary Art which is the artist residency/community arts program that’s killing it and doing really amazing things. And there are a lot of galleries here but there’s a disconnect with the type of work. There’s a lot of opportunity to show work, but there’s not a lot of opportunity to sell work. So you can be an artist, and that’s fine, but there’s not many of us that actually support ourselves as artists. There’s not enough of a community to have people actually start collecting work so then it becomes really tricky. Especially if you make stuff that’s really hard to sell to people. It’s a little bit harder to sell a sculpture than prints of a painting or something. Yeah, a lot of people want just really easy things to go on their walls. For a long time in my practice I didn’t make anything anyone could buy, because I refused to install things in people’s houses, like, I’m not coming to your house to work. That sounds real creepy. 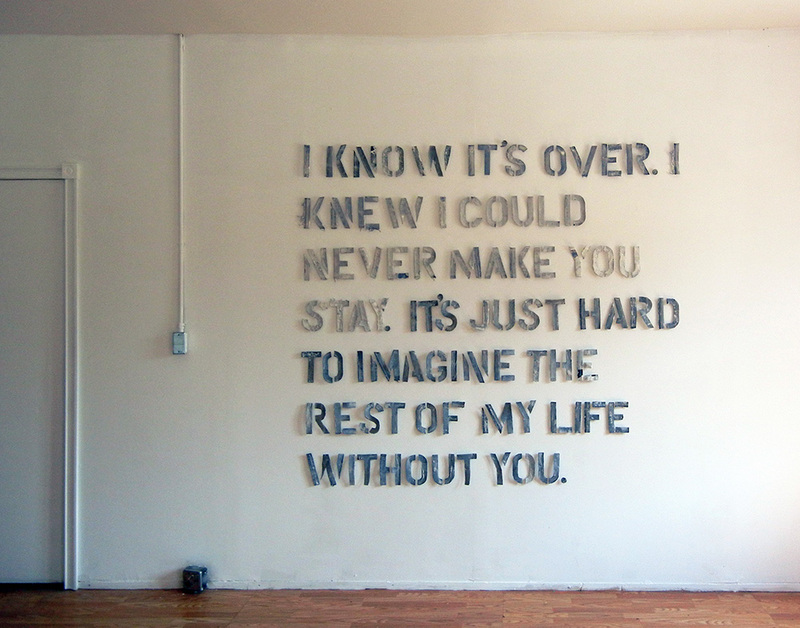 But now I make objects that can actually go on walls, it’s a pretty interesting change. It’s fortunate that people do collect the pieces and that the work does sell. What kind of stuff of yours now ends up in people’s houses? 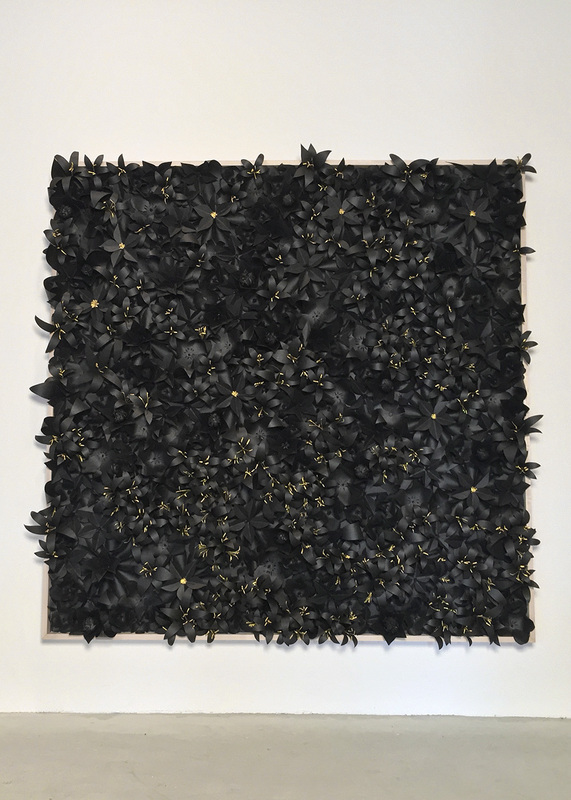 All of the pieces actually end up in people’s houses—well, actually, there are two black flower pieces that got purchased, but institutions purchased them, a museum purchased one, and a college purchased the other one. I’m kind of really particular about who ends up with my stuff in their private collection because you don’t want…I mean the work is so racially charged that personally you don’t want to sell work to someone who is a racist, or doesn’t get it. It becomes really tricky. Right, it’s something that you spent so long on, and have so many ideas about, and then it’s like, oh, my baby. I like a very small group of people who are very serious collectors to own [the art], so it doesn’t necessarily just become some object you have above your couch. Yeah, I’m sure that wouldn’t sit very well. It becomes very uncomfortable. There are two approaches to collecting. I know people who make hundreds and hundreds of paintings in a year, and there are people who almost…I can think of artists who, the majority of people that I know who are collectors and other people own their pieces. And there are some people who feel really comfortable with that, but I don’t like that idea. I like a very small group of people who are very serious collectors to own it, so it doesn’t necessarily just become some object you have above your couch. Because you’re trying to make with your work, so you want the statement to live on. So what are you working on right now? So right now I actually just finished a residency program at Bemis Center and I have several shows coming up. So what I’m going to start working on is: I’ve been thinking about the idea of how society views women, and the idea that women can become “ruined”. Based on these bizarre ideas about what purity is supposed to be. So I’m making nets, cast fishing nets, and chainmail scarves, objects that I’ve never…things that are so unlike anything I’ve made before. But I think it’s an interesting idea to play with. Is the “White Girls” piece part of that series? Yea, the “White Girls” piece is part…so in the last maybe two years I decided I wanted to make work that started addressing racial identity. And then in maybe the last six months I started with this idea of…as a child I was really obsessed with white people. I wanted to be a white person so bad, and I was trying to think of where the idea came from, because I didn’t grow up watching television. And my parents were actually really radical in their politics, so they never thought that being black was bad. So I was thinking about it for a really long time and I was like, I think I got it from being in grade school, so the white girl piece came out of that, that childhood obsession. Which is like what the new theme is about, trying to figure out these obsessions I have in my own life. 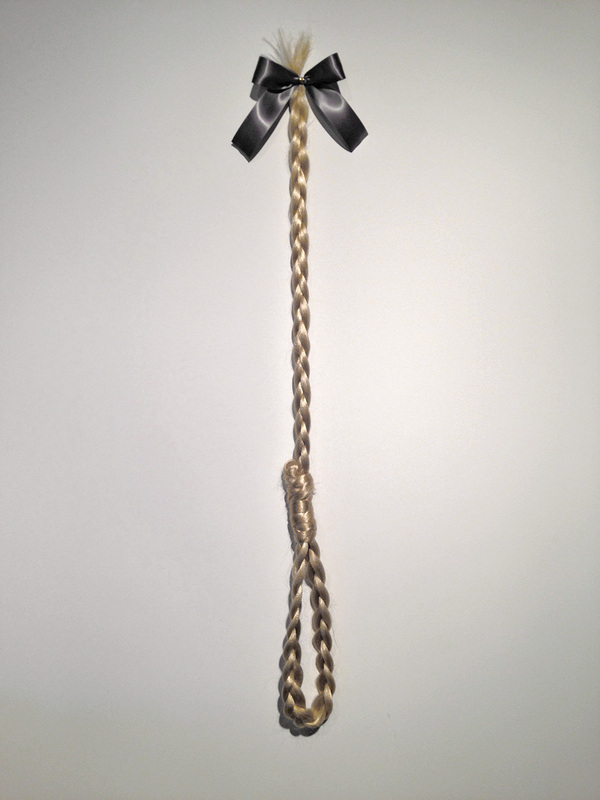 But yea…making nooses. I thought that was a very arresting image. It was so interesting because it’s like…I checked out your work, saw what you were working on, and then this new piece popped up like out of nowhere, and it was like wow, that makes a statement, you know? People…I showed it in a gallery and the gallery owner’s response was like, “is this work about hating white people?” It’s like…I…NOPE…don’t hate white people. It’s like those conversations you have with people where you have to remind them, oh no, I am half white. I don’t have a problem with white people. Right, and that’s not even the interpretation I arrived at. Seriously…and is like any commentary on white people a desire to kill them? Can’t I just talk about obsessions? I feel like I can just talk about obsessions. I’m just a regular person. We aren’t special. There are a lot of mixed people in the world. Yea, I feel like you’re within your right to do that because a lot of times people who are multiracial kind of get obsessed over, so curious about “what are you??”. 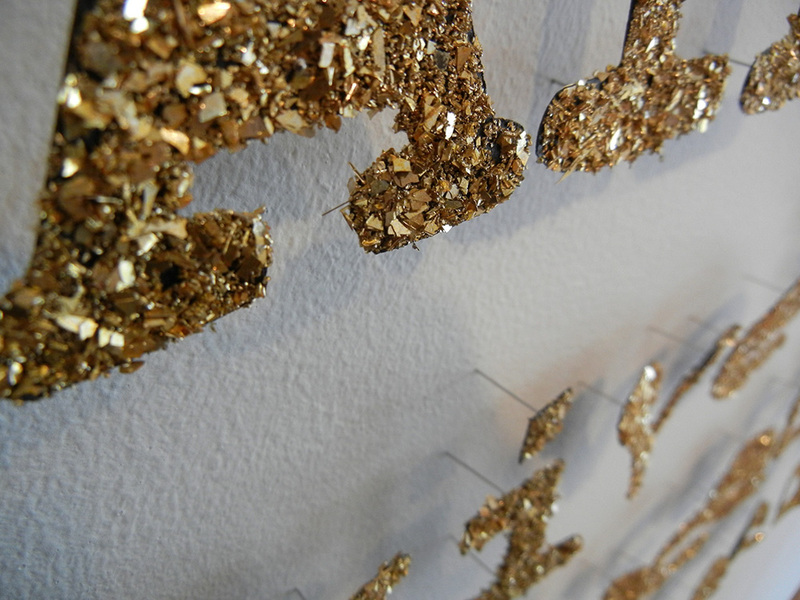 Yea, when I made that “Unsolicited” piece, that really shiny glittering one…gold is the color I use in my work to represent myself, because society is so obsessed with mixed people they become these—I’ve had so many awkward conversations with these people where they’re just like, fetishizing me. Oh no, I’m just a regular person. We aren’t special. There are a lot of mixed people in the world. America is very obsessed with us. And it’s a little concerning because it actually highlights racism. Right, my mom is a person and my dad is a person. So what’s the biggest difference between the art you made when you were just starting out and your current art practice? When I just started out I was making work that was pretty much all about personal relationships. I was doing a lot of text-based art, and making these pulp pieces that were made out of people’s clothing. So the work was pretty much about all of my private, personal relationships. And the shift has now been, I’m really interested in how people interact with me as a person, just random strangers. The work has gone from being self-focused on my private life to being more focused on how the public interacts with me and how I interact with the public. I think that’s the main difference. And I don’t really use text really—the new work really isn’t text-based. I’m trying to make more objects that are loaded with meaning and the people can…there’s something really appealing about making an incredible object that’s something really terrible. So I’m playing with that notion more now. The viewer is seduced by the beauty of the piece, but then there’s that stopping and thinking about what this actually means that I really like. Is there a piece in your work that is particularly successful to you in doing that? I think the black flowers, the two self portraits, those were the first—those pieces were the turning point in how I did my practice. Because they’re these incredibly beautiful objects…I just sold a piece to a museum of one of those, and it was in the show, and people—I think that it was the most successful piece that I’ve done that people get that it’s a beautiful object, but then there just like, ‘why does it look like it’s in a coffin? Why is it a little dark and creepy at the same time?’ I thought that that was like, oh yea, people do get it. I can make these pieces that are really beautiful but people are getting that there’s something underneath. Which is a really good feeling. It’s working! I’m not just alienating people. When I was making text work, I didn’t want to alienate the audience, so I chose to use text because I felt it was a really easy way to connect with the viewer and make it absolutely clear of what you’re trying to say. So there was a fear of going away from that, of being like, ‘oh, I’m going to hopefully have the viewer still able to engage with the work.’ And they were! I was really pleased. They’re actually doing what they’re supposed to do. Yeah, I feel like sometimes we don’t give our audiences enough credit. Sometimes there’s some silent, intuitive communication going on through artist and viewer. But then other times it’s completely lost. [Laughing] Sometimes! I’ve had very interesting conversations with viewers. I feel like the hardest thing is like, ‘nooo, it’s a satire!’ People don’t understand satire, I don’t think, very well. 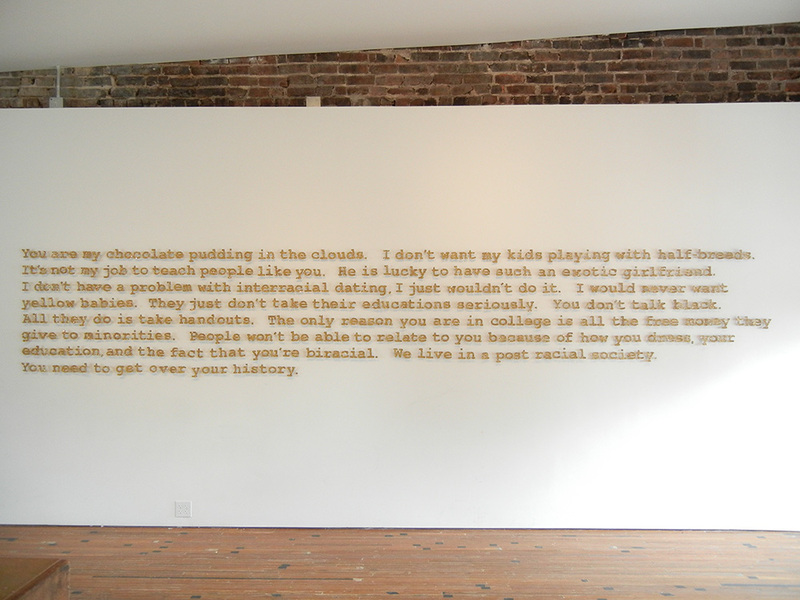 When I had the opening for the first show where I had a solicited piece, with the glittery letters, there were people who were like, ‘so are you saying these things about other people?’ And was like, ‘uh NO, I’m not putting racism on a wall and telling you to come look at it.’ I’m like, I don’t even know how you would get that. Everyone has a different level with which they engage with work. I think that contemporary art has done a pretty terrible job of connecting with viewers. You just kind of have been, ‘well if you don’t get it, you don’t get it, and that’s your fault.’ Not being like, oh I think we actually have a responsibility as artists to make sure the viewer is able to engage with our work. Right, it allows us to be a little lazy. Art school is kind of…they’re raising some pretty lazy artists at times. Do you have any thoughts about how we can kind of change that, or is it just simply being more aware of how your stuff translates? I think it’s good to be aware of how your work is actually translating, and I think it’s good to actually talk to people who aren’t artists about your work. I think a lot of times, we don’t get that opportunity to talk to people who have no exposure to the art world, and have to critically think about our work. It’s kind of a privilege, it’s also really a little unsettling. Sometimes when you have open studios and the public comes, it’s like, oh right. Let’s have these conversations. But it’s the only way—I really do think we should think about our audiences. If we really want to make objects that matter, make a difference, you’re really going to have to think about your viewer at some point. You can’t just make it in a vacuum, be like ‘if they don’t like it, they don’t like it’. Okay, why are are you showing it to anyone? It’s interesting that a process you use to make sure that your work is relatable is something that people use for huge eCommerce sites. We always have to go back to the end customer, quote unquote. So it’s interesting, because it seems like a very data-driven format, but it’s very people-centered. In undergrad it was really strange, because I had such an obsession with not wanting the viewer to be isolated. I think it was because I was such an isolated weirdo, bullied child. I didn’t want to isolate other people. But I think everyone should be able to value art. I have one of those bizarre, idealistic, like ‘it’s for everyone!’ Everyone should appreciate art, as Sunday morning special as that sounds, I actually do think everyone should enjoy art. It’s part of our humanity. It’s not just for rich people or those who are educated enough to appreciate it. So there’s an interesting materiality to your work. When you generate ideas, what tends to come to you first, the concept or the form? Actually, the concept. It shifted over time. When I first started making work in my undergrad, I would actually come up with titles first that would kind of embody how I wanted the piece to make someone feel, or how I felt the piece should end up being. So I’d come up with the title, and then make the work in the framework of the title. But now I come up with what feeling I want in the piece, and how best to communicate that feeling. Then I just kind of geek out over materials. That’s so interesting because I feel like that’s the exact opposite of what most people do. People struggle to apply a title to something they’ve made, you kind of tack it on. I love titles! Some people really have a hard time but I love making titles for work. I love to be really verbose and obnoxious, they’re really great. 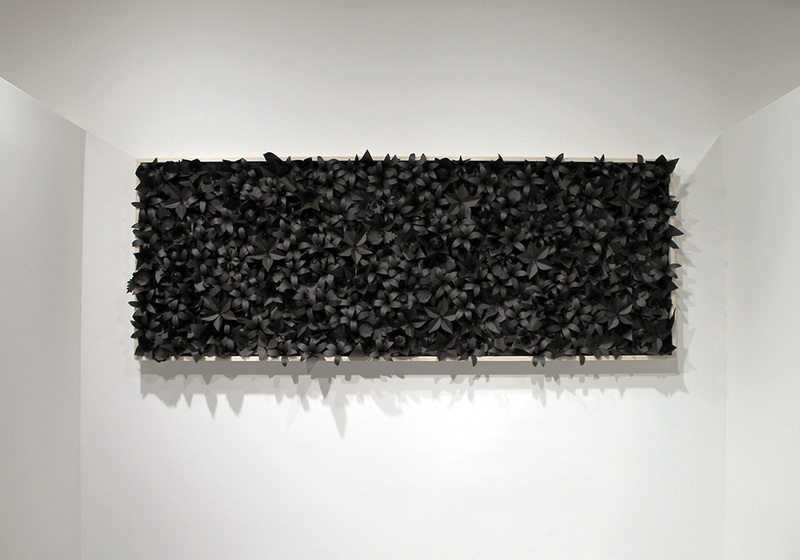 Tar paper isn’t something I’ve seen in a lot of pieces, I actually can’t think of any other work that has it. So I was curious what significance the material has for your work and why it makes an appearance in several different pieces? When my…three years ago my father died. Before he died, he had a masters in physics and he taught mathematics at the college level. And he was really obsessed with outer space, and I got that obsession from my dad. After he died, I didn’t make work for maybe about a year. But then I had a solo show that was all about him. So I started using this technique where I had all these little squares of tar paper and then dipped them in soy wax, which is a really white wax. What that did was: soy wax would bleach all the toxins that are in tar paper, and made it look like NASA photography of meteorites. 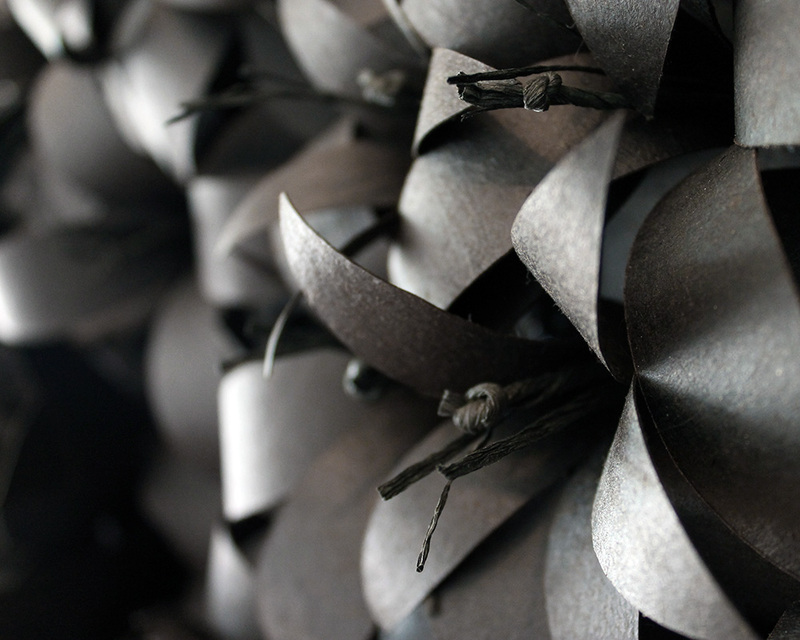 [Using the tar paper is] like playing with this idea that this is a really beautiful color and a beautiful material, but it’s also really disgusting and dirty and it kind of reflects how society views blackness. So that was the first time I used it. And I used it because black is the color of the night sky, and that’s what outer space looks like. And I started using the wax because my parents had a really interesting relationship. So I used it in a very surface-level way, my father is black and my mother as white, to represent their relationship. Also wax has this weird preserving element, we coat in wax to keep things kind of tucked in and safe. So I decided starting playing with that idea. So tar paper then became this…what I used in my own work to represent myself in my self portraits. It’s like playing with this idea that this is a really beautiful color and a beautiful material, but it’s also really disgusting and dirty and it kind of reflects how society views blackness. Because when I was showing this in public spaces, I think that maybe a fourth of the people would be like, ‘well why are they black? Why are you using black as the color?’ And I also thought that was interesting because I don’t think black is a bad color, and I don’t think black is death. I do like the fact that they’re made out of this toxic material that you have to kind of have to confront how you think about race, and what society has deemed beautiful. Wow. There’s just layers and layers to that, that’s really cool. And that’s a weird thing, when I talk to curators, that’s the thing they point out, that the work is really highly conceptual, but it’s also really craft-oriented. It’s so ’process’. ‘Oh no, I’ll just spend 600 hours doing this’. I was actually curious, which of your pieces in the most time intensive? Because they seem like they would take a long time. 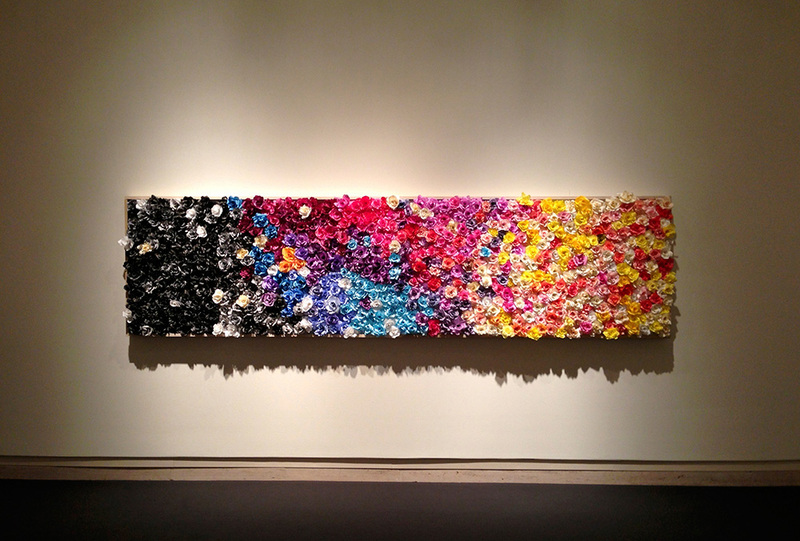 That really colorful flower one, that took 700 hours. That’s the most…that piece broke my hands. For a very long time I wasn’t able to use scissors for an extended period of time after that piece. I had to trace everything, cut everything, and put them together. Yea, that piece was…I will never make another one [laughing] ever again! Even if people are sometimes like, ‘oh I really like the colorful ones. Can I have one?’ I’ll be like, ‘NO’. Never again will I do that to myself. I totally feel you, I have a tiny little illustration project that I started where I was like, I’m going to make miniature versions of all the cool buildings in the city, and then I was like oh, it took me forever just to do this digital, tiny little thing. And I’m like, nope, no more. Not worth it. I have this really weird thing with projects…so I had a studio assistant when I was at Bemis, and she was a painter, and I think that people who work in process become kind of weird, the things we do that are uncomfortable we don’t even think about the fact that we’re doing them. And she was complaining about not wanting to make canvas stretchers for her paintings because it took too long, and she didn’t want to do it. And I was like, I don’t like most elements of my practice. I don’t…I just do it. You just have to push through it. I’m never really impressed with the time it takes to do something. ‘Oh, well if it takes 600 hours, it takes 600 hours.’ There’s really no other option. How do you document and process new ideas? I write a lot. Kind of an obsessive writer. I take a lot of notes. And also I have a bizarrely good memory with recalling things people say. I don’t know where I inherited that little trait from. But yea. Pretty good memory and I write a lot of stuff down. And Post-It notes. I have 15 Post-It notes just scattered on my table in front of me. That’s how I process things. Always thinking. You’re in a shared studio space? We were when I was in the Bemis studio, now I work out of my home studio. But I just got another studio, so I’ll be splitting my time between two. Some places need to be really clean and the tar paper is so dirty, I just don’t like to spread it everywhere. Silence, good lighting, and a warm room. That’s really all I need. So what are the conditions that you need as an artist to be doing your best work, or most prolific? I actually really enjoy silence. I like to be left alone for a long time. Which is a hard thing to do in a house with someone else. But those are the things, I just like to be left alone. And have lots of really good lighting. It’s really simple things. Silence, good lighting, and a warm room. That’s really all I need. That’s awesome. So one of your most powerful works for me is “Unsolicited”. So these are all things people have said to you in the past? Yeah, it’s a collection of…so the very first statement about the chocolate pudding is what my grandma used to call us when we were babies, just a terrible thing for someone to say to another person. My family kind of embraced it in a really weird way. So I started from the very beginning of my childhood, to more recent things people say, and I think the really interesting thing is that there is a shift, about halfway through the piece where it becomes…at the beginning it’s like people calling us half-breeds and being more aggressive in why they don’t like me, but then it flips to when people are making these comments where they aren’t actually talking about me in their opinion. I’m not ‘that kind of black person’ in their minds, so they’re talking about ‘they’ and ‘those people’ and how other people are the problem. But yea, those are the things that people say. That’s a small segment. Yeah, I was really curious what your process was like in putting together the text content for that piece, kind of curating it. Maybe there’s kids in that gallery or something. Yeah, that’s like a running list for my life. I have a long list of the ridiculous things people say. It’s pretty unbelievable at times. I read some of the news articles of some of the experiences people have had that are similar to this, and I just can’t…I mean, I can believe it, but it breaks my heart, you know? I was at a coffee shop last week, and the person who was sitting close enough that I could reach out and touch him was going…so we have a person that sits on our board of education in Nebraska and he just got in trouble because a few years ago he posted an article that called the President a ‘half-breed’. Yeah. And he’s refusing to step down because he doesn’t think it’s offensive. And the person in the coffee shop was defending the idea there’s nothing wrong with calling the President of the United States a half-breed because ‘it’s not an offensive term’. And then he was like also addressing how two weeks ago there was a fire at a house in a city that’s right across the river, and this woman has mixed children and mixed grandchildren, and they’re investing the fire as a hate crime. And the person was like, ‘that seems a little far-fetched. No one has a problem with mixed people anyway’. And I was like, oh my god. They spray-painted swastikas on this woman’s house. I think this is a hate crime. At this point you can’t pretend like, because you don’t see it…He was such an authority, it’s like you are so confident in the belief that you are right right now. And also in public. And there are brown people around you! Ignorance is a powerful thing. It makes people real comfortable and confident in the things that they will say. Do you have any challenges in your art-making that you need to push through or deal with in order to make good work? I think that I do. I suffer from a lot of really bad anxiety. I think for a long time, even in my undergrad, I didn’t think my work looked like other people’s work. So it made me really uncomfortable about it, like I thought it was a weakness that I didn’t make work that looked like other people’s, and I also wanted to talk about feelings. Like, feelings some more…and relationships…really great. It was like a huge source of anxiety for a long time. And it still is sometimes. I spend a lot of time questioning whether or not the work is functioning properly, am I doing enough, am I working hard enough. I live in my head a lot. And I think that that…I think most artists. I’m pretty good at spiraling in my head, obsessive about things. And I also have a really bad habit of revealing everything to people. I was like, ‘let’s talk about everything, be really honest’. Aww, we would be GOOD friends. And then there’s parts where I know that I’m a bit of a weirdo in the art community I work in, so there are challenges that way. Wanting to make the work you want to make, and have the conversations you want to have. I think that a lot of my work hasn’t been perceived very well by a lot of older, white men in the art community. So that was a really big challenge. I got in a show…there was a Crystal Bridges show where they searched through like 10,000 people and found 102. And I was one of those people and it did not go over well in my local art community. A lot of people had very strong opinions that I was picked because of the type of work that I make, that I’m too young, no one’s ever heard of me. Why are you saying these things out loud?! Oh my god, people are so aggressive. I was like…I don’t think this is appropriate! I was just kind of like, I don’t know what you want me to say. Am I supposed to apologize? I just feel like that’s bad reporting. You’re not supposed to make someone feel like they have to defend something good that happened to them. So, are there any themes or media that you haven’t explored yet that you’d like to develop in the future? I think the new work is actually the…the idea of ruin and collapse is such a specific idea, but trying to apply that feeling in my head sounds amazing, but now I have to make these pieces that actually reflect that to the audience. So that’s the new thing that I’m like, ‘how am I gonna do that? Is it gonna work? Are people going to get this if they don’t look nice?’ And I’m using all these materials I’ve never done before, like chainmail. I’ve never made chainmail! It’s a new thing that I learned to do, and that’s really exciting. So you’re livin’ the dream, right now. Yeah, I’m gonna do this! Awesome! If you could collaborate with anybody, who would be your dream collaborator? I would love to work with Felix Gonzalez Torres, he’s a contemporary artist, in the 90s he died of HIV. But his work was unbelievably good, unbelievably good. Made some of the best contemporary art that I’ve ever seen. And they’re so beautiful, it’s all about loss and longing and living your life knowing you’re going to die. So all of his work is all about the viewer takes something—he has these big piles of candy—takes it and eats it, and the art is just entering your body. He has to deal with the idea that he’s going to go away at some point. They’re such good pieces. Nice. I haven’t heard of him so I have a lot to look at, I think. Yeah, Google him, he’s so good. He’s so good, oh my god. So, besides the work that you’re currently doing, what are your goals as an artist for 2015? My goals are to get into graduate school. That’s a goal I don’t have a lot of control over. I have these three shows I have to work on. But I think the goal is to make better pieces that are stronger and more effective. To not be riddled with self-hatred all the time. That’s a good goal to have. Oh gosh, girlfriend, I’m working on that too. [laughing] Seriously! I want to not dislike myself so much at times. I think my main goal is to learn how to be more comforted in my work, and more comfortable with my success because even though I’ve had a really good last year and a half, I still can’t feel comfortable with it. I’m always like, I know I can do way better, I’m not trying hard enough. So I’m trying to figure out a way to navigate that anxiety. So to not be riddled with anxiety is the goal of 2015! Yeah, that’s an interesting conflict, because you make work because you have these feelings, but then it’s also like you don’t want them to take over so that you can’t do the work, you know? I don’t want to be bogged down all the time. Right. Can I not feel anything for just a little bit? I have those moments where I’m like, ‘we’ll just stop talking.’ Just stop talking around me and let me be in silence. Let me have space, it’ll be really good. Yeah, especially with the current climate in the United States and everything that’s been going on. So much going on, oh my gosh. You’re like, ‘is it going to get worse? Oh it is going to get worse.’ We haven’t hit bottom yet. Or we were close to it. I can feel the ulcer forming. I feel like that all the time. I feel like I’m going to have cancer at 60. Any time you can spend a large amount of time thinking about your practice is really good. So you’re applying to grad school so you can grow in your artist’s practice. How do you think going back to school will help you do that? I think it’ll be really beneficial because any time you can spend a large amount of time thinking about your practice is really good. And being around other people who are really dedicated to their own practice, it’s really motivational. I find that there are parts of me that don’t like living in Omaha because I think there are some people who want to grow in their practice, but there are a lot of people who are artists who become really comfortable with what they’re doing, and they’re not contributing to a critical dialog of what’s happening in our history, in contemporary art, and kind of shaping the canvas of what art history will be in 20 years. So I think graduate school will help dial into those conversations. To be like, let’s critically think about the work. What are you doing, what am I doing, how is working, how is it now. It’s a really intensive residency program. Residencies can be really beneficial because you are surrounded by other people who are making work and figuring it out. Besides working on your art, what excites you? I think a lot of really nerdy things, like watching science videos and going to the zoo and going on nature walks. I like that I have interests that don’t make sense for me. I like reading science articles about animals and outer space…and eating…and going to the zoo! I’m really obsessed with baking. What’s the most delicious thing you bake? I make really good pies. Pies and cakes. I used to want to be a chef. Then I graduated high school and I was like, eh, that’s a terrible idea. If you were a chef you’d be on some reality TV show making something out of Pop Rocks or something. Cool, so my last question is one that I ask everybody: which badass ladies are inspiring you lately? Ooooh. Art-wise, I think Kara Walker is a badass lady who inspires me. And Carrie Mae Weems is another one. I’m working on a post about her! She’s amazing. Yeah, she blows my mind. Adrian Piper is a lady who’s badass. I also think that Jenny Holzer is a crazy-talented lady. I like the ladies who make really bold art, that have kind of been game-changers in how people view female artists. Big thanks to Angela Drakeford for your insights on contemporary art, current events, and your own art practice! To see more from Angela, check out her portfolio.